The Anco FIT product line was developed to empower animals to be more robust and efficient in the face of dietary challenges and stressors. Anco FIT is a gut agility® activator containing active natural ingredients specifically selected to help animals adapt to nutritional stress factors and live up to their performance potential. With increasing consumer pressure for antibiotic-free animal diets the addition of Anco FIT to animal feed offers ideal support for more consistent, safer and more profitable animal protein production. Applying the concept of agility to animal nutrition can help to further develop efficiency from animal feed in animal production. The gut is particularly responsive to stressors. Hence why the emphasis is on the gut, when improving the animal’s adaptive response to stressors by nutritional means. 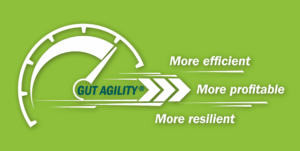 Gut agility describes the animal’s ability to adapt to nutritional stressors in a faster and more energy-efficient response than it normally would. This results in more consistent animal performance, supports the animal’s well-being and impacts the profitability of the producer of safe food from animals. A simulation model that predicts the effect of the social, physical, and nutritional environments on pig food intake and performance was extended to deal with individual variation. Reactive oxygen metabolites generated during normal metabolism and metabolism stimulated by xenobiotics can enter into reactions that, when uncontrolled, can impair performance. Most, if not all, of the reported effects of mycotoxins are negative in terms of intestinal health, for example, decreased intestinal cell viability, reductions in short chain fatty acid (SCFA) concentrations and elimination of beneficial bacteria, increased expression of genes involved in promoting inflammation and counteracting oxidative stress. These effects are almost certainly occurring across species. The gastrointestinal tract is the first physiological barrier against food contaminants, as well as the first target for these toxicants. An increasing number of studies suggest that intestinal epithelial cells are targets for deoxynivalenol (DON) and other Type B trichothecenes (TCTB). Nutrient ingestion triggers numerous changes in gastrointestinal (GI) peptide hormone secretion that affect appetite and eating. This review focuses on mycotoxins which are of concern in terms of occurrence and toxicity, namely: aflatoxins, ochratoxin A and Fusarium toxins. Results from nearly 100 published experiments (in vitro, ex vivo and in vivo) were analyzed with a special attention to the doses used. A meta-analysis was carried out to study the association of mycotoxins with performance, productive indices, and organ weights in broilers. Ninety-eight papers published between 1980 and 2009 were used, totaling 1,401 diets and 37,371 animals. The mycotoxin presence in diets reduced (P < 0.05) feed intake by 12% and weight gain by 14% compared with control group. A meta-analysis was carried out in order to study the association of mycotoxins with performance and organ weights in growing pigs. A total of 85 articles published between 1968 and 2010 were used, totaling 1012 treatments and 13 196 animals. The presence of mycotoxins in diets was seen to reduce the feed intake by 18% and the weight gain in 21% compared with the control group.